Lord again winner of race, and best junior, and Buster best junior. 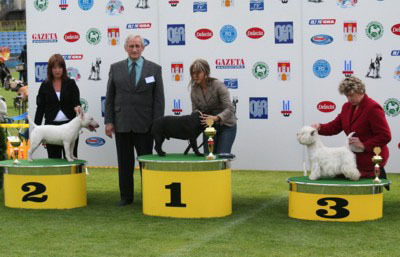 On Saturday our two little dogs - Warbonnet Filadori "Buster" and Parabellum Lord Byron "Lord" finished JUNIOR LITHUANIA CHAMPION. 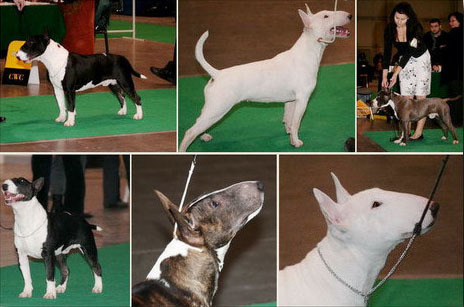 Sera de Bullcok "Sisi" again won race (BOB, CACIB), and Lord again became winner of junior. 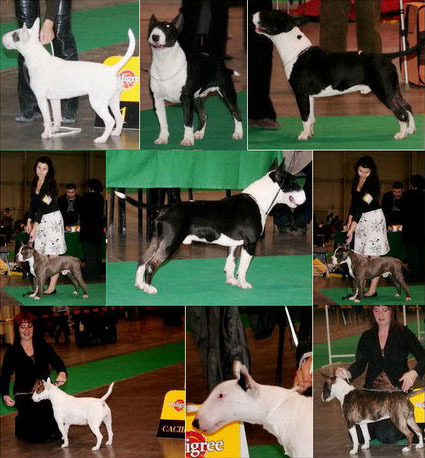 Sera de Bullcok "Sisi" on international shows won race (BOB, CACIB), and Lord became winner of junior. 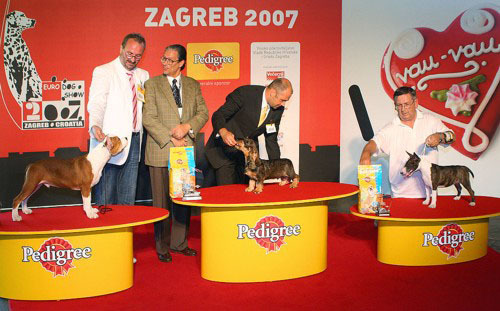 On international show in Prague Sisi got on Cruft's appointment winning race (BOB, CACIB, NSwR, CAC), bacame "Prague Winner" and finished INTERCHAMPION. 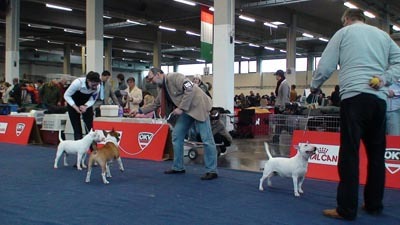 This is 5th Interchampion title in our kennel (OLIVER, MADI, LARRY, SPIKE, SISI). Lord with perfect note was second in Juniors. On international exhibition Piggy won Juniors. Lord and Heidy got excelent notes in Dortmund. 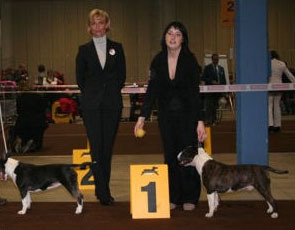 Lord won breed (BOB), and Heidy was best female (CACIB). On Junior cup Lord has proceeded on to the strict cup-final and obtained beautiful Cup. On Club Type Bull exhibition Lord was Junior Winner Type Bull Club 2007. Lord has finished Junior Poland Champion in Warsaw. Lord won breed (BOB) and got 2nd place on BEST Type Bull and 2nd place on group III (BOG II). LORD's successful debiut in Poland. 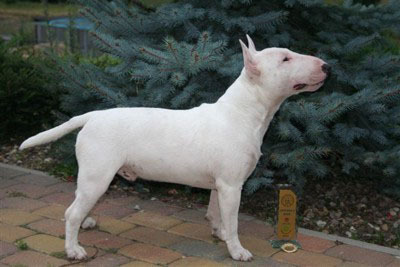 He won breed (BOB) and become BestJ Heidy's next CACIB and BOS. Larry has finished Lithuania Champion in Palanga. 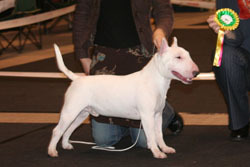 Our kennel has been increased about 9-month white minibull from Parabellum kennel from Estonia. 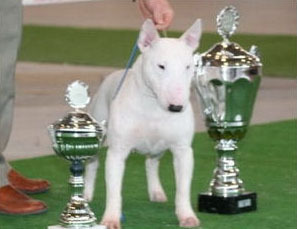 Minibullterier Jolly (Sisi's and Spike's daughter) was best junior in Krakow and won bred (BOB), ending Junior Poland Champion. Congratulations for Alina and Mariusz. We are very happy, that Jolly went to such good hands. 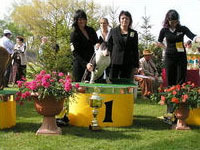 Heidy got CACIB and she was best female in bred. Buster has finished Junior Champion of Poland in Lubieszyn. He has made it in 7 days, have finish 9 Months and 9 days. Buster Junior Winner after first show in junior class. 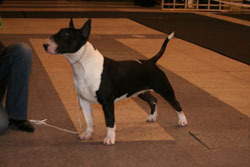 Great success of Kaja Ewimark Rakownia: Best Baby in Breed and 3rd BEST IN SHOW BABY. Buster Best Puppy in Breed and BEST IN SHOW PUPPY. 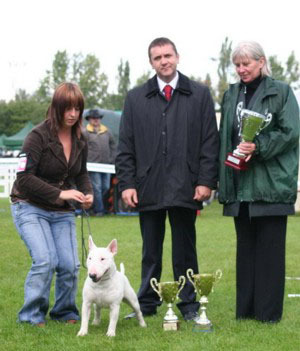 KILLER PIGGY Ewimark Rakownia - Best Baby in Breed and BEST IN SHOW BABY. 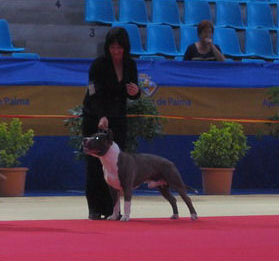 Larry - from champion class get CACIB, and Best Male, he became new INTERCHAMPION. We are very happy and proud from those results. He spend a great time in Mallorca with my friends Ewa and Jose Luis. Thank you Ewa for such great handling of Larry, he get the last 4th CACIB for his International Champion titel. Also big thanks to Jose Luis who help us so much and take care about Larry. Thanks to you both one more time, we can see on photos that Larry spend there few days of great vacations. Great Success of Spike (CAC, BOS, BOB and BOG). Great success of Spike - Inglislim All Or Nothing - (CWC, BOS, BOB, 2 BOG). Buster IV very promising, Iris excelent. 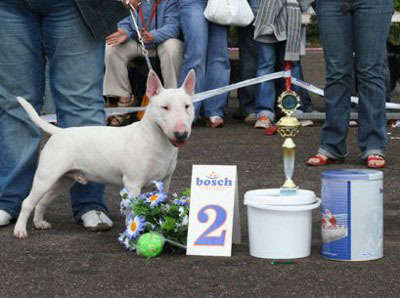 Spike was in Luxemburg, he won I exc, CAC, CACIB, BOS and BOB from champion class and became a new Luxemburg Champion. We get great result in Berlin. 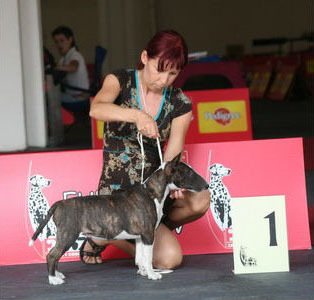 Heidy first time in intermediate class won CAC, Anw.Dt.Ch. VDH, CACIB and BOB. 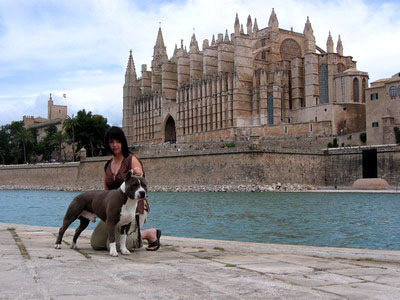 She was perfect show by my handler and friend Jose Luis from Mallorca. Buster won puppy class and get excellent raport from judge. In CAC Show in Legionowo in Poland Heiedy won Junior Winner and Best Junior in Breed and she finish her Junior Polish Champion. Buster on his very first show get I place very promising note and Best Puppy and also in BIS PUPPY he get 2 place. 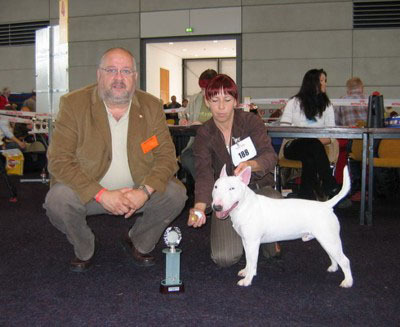 Heidy get excelent I and Junior Winner, Best Junior in Breed.